The Trump administration discussed last week the possibility of "a new military action" against Syria as a punitive measure, citing Damascus' alleged use chemical weapons in Eastern Ghouta, the Washington Post quoted unnamed US officials as saying. According to the newspaper, the topic was discussed during a gathering in the White House, which was attended by President Donald Trump, Chief of Staff John Kelly, National Security Adviser Herbert McMaster and Defense Secretary Jim Mattis. The Washington Post cited a senior US administration official as saying that Mattis was "adamantly" against acting militarily in response to the reports about Damascus' chlorine attacks and that McMaster "was for it." Another official claimed that at the end of the day, "the president did not endorse any military action and that officials decided to continue monitoring the situation." Chief Pentagon spokeswoman Dana White, for her part, denied Mattis taking part in the White House meeting on the use of force against the Syrian government, saying that "conversation did not happen." In early February, the Syrian Foreign Ministry said that the US accusations that Damascus used chemical weapons in Eastern Ghouta are groundless and that Damascus strongly condemns such allegations. On January 26, the White Helmets, a Syrian opposition civil defense group operating in militant-held areas, reported that three civilians had been killed and dozens more were wounded in a suspected chlorine gas attack on Eastern Ghouta. 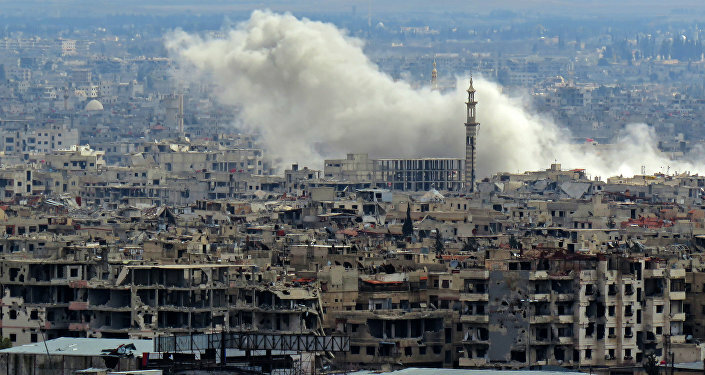 In another development that day, US State Department spokeswoman Heather Nauert accused Syrian authorities of staging this attack, which was vehemently rejected by Damascus. Mattis, in turn, said shortly afterwards that there is no evidence that gas has been used in Eastern Ghouta thus far. On April 7, the US launched 59 Tomahawk cruise missiles at the Syrian military airfield in Ash Sha'irat, located about 40 kilometers (25 miles) from the city of Homs. US President Donald Trump said the attack was a response to the alleged chemical weapon use in Syria's Idlib, which Washington blames on the Syrian government. Russia described the attack as an aggression against a sovereign state.